Gravely ill patients teach medical students about listening and compassion. 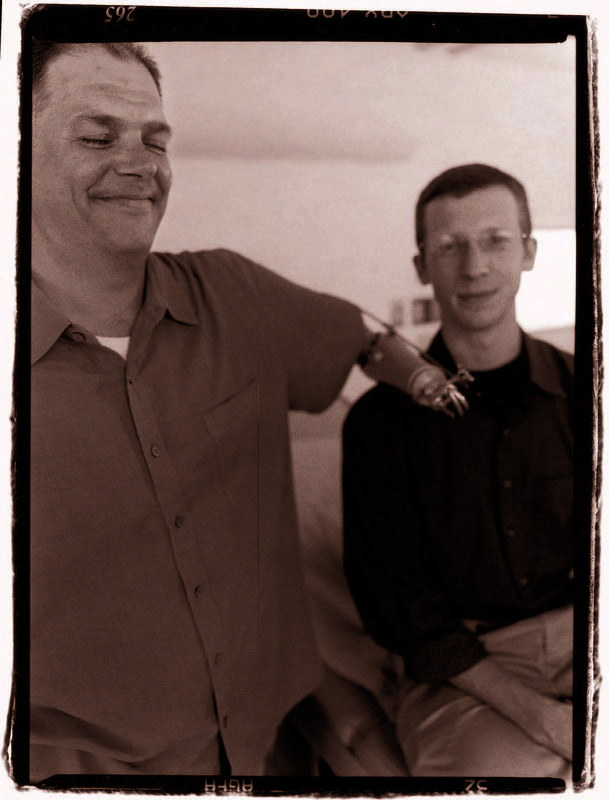 Steve Cappiello, his life changed by “a hunk of plastic,” and student Patrick Codd. Cappiello is referring to the prosthetic left arm he has been awaiting for months, since losing his limb to cancer. For this once-hardworking day laborer from Brockton, Massachusetts, the “hunk of plastic” offers a chance to regain independence, support his family, and feel useful again. No longer will he need to ask for help buttoning his pants or tying his laces. “That’s awesome,” Patrick Codd says as Cappiello bends the cabled arm and maneuvers its hooked hand. Codd, a medical student, has also been looking forward to this moment, having witnessed Cappiello’s emotional low during the weeks before his insurance company approved coverage for the prosthesis. The harrowing story began in the summer of 2003, when a glass pane fell on Cappiello’s hand and broke some bones as he removed lead paint from an historic home. The tennis-ball-sized mass that soon ballooned on his wrist caused round-the clock pain that he claims was ignored by his community doctor for several months, yet drove Cappiello to puncture the growth with a nail and run it under scalding water to relieve the ache. • "My life had been uplifted "
When it was finally diagnosed as sarcoma, the cancer had already chewed through his bones; his oncologist believes it was probably present before the injury. After several rounds of chemotherapy and radiation, and hours of surgery to reconstruct his hand, another mass appeared on his arm—which Cappiello agreed to have amputated above the elbow. Now, as they sit in an examination room at Dana-Farber Cancer Institute in Boston, where Cappiello eventually came for treatment, Codd probes Cappiello’s anger at the months lost before his diagnosis, as well as his fears about the future. “Every day I pray to God that my kids don’t get cancer,” he says. Codd, a clean-cut, 23-year-old redhead from Colorado, was one of 19 students who enrolled in the course last spring. The three-pronged class features meetings with patients (in homes, medical settings, or wherever else they choose), weekly small-group discussions with faculty members and fellow students, and lectures covering such topics as spirituality, hospice services, and cross-cultural care. The accompanying reading list includes poems, essays, and popular and academic articles by leaders in the field, such as professor of psychiatry Edwin Hughes “Ned” Cassem, Recanati professor of medicine Jerome Groopman, and Rachel Naomi Remen, the California physician and best-selling author of My Grandfather’s Blessings. On one level, “Living with Life-Threatening Illness” is about the simplest of concepts: how to say hello, say goodbye, and listen. But by tackling issues so often avoided, the course also helps at least a handful of trainees become more comfortable with death and dying as they begin evolving from laypeople into doctors. This comes at a time when patients and families increasingly seek better end-of-life and palliative (comfort) care for themselves and their loved ones. By putting themselves in their patients’ shoes, the students grasped the value of hope and the need for seriously ill people to set realistic goals—like attending a child’s wedding or graduation. They discovered the power of teamwork to solve problems and to support one another in the future as physicians facing enormous professional pressures. Perhaps most important, the group learned that even when a patient has no more known chances for cure, the expression “There’s nothing more we can do” is never acceptable. “Sitting down with a person and talking about real things is one of the most rewarding experiences in medicine,” says associate professor of psychiatry Marshall Forstein of the Cambridge Health Alliance, who has taught in the course for many years. “Students learn that the time you take to sit at the bedside of a patient who’s about to undergo surgery and say, ‘I came to see how you’re doing,’ is what’s important. Your technical skills are important, too, but patients thirst for connection. Matthew Newnan’s room on the eighth floor of Children’s Hospital Boston exudes as much personality as the six-year-old patient who occupies it. The small space is jammed this April afternoon with toys, cheery drawings, and likenesses of Pooh and Tigger painted on the window. Matthew sits on the bed with his mom as nurses stop by in turn to adjust the bags and tubes cascading from his IV pole. Normally a vibrant boy who commands the hospital hallways with his charm, Matthew today is uncomfortable, teary, and eager to nap. Through the course, Hanudel and his classmates discovered the extent to which illness causes loss: of physical ability and looks, of self-esteem and control. Patients often had trouble planning because of the ups and downs of treatment; “I was supposed to meet my patient this week, but she was too tired to get together” was a common refrain. As the weeks passed, some of the patient volunteers in declining health came to accept their fate, while others remained hopeful or went from death’s edge to improved health. A few died. The trainees discovered that every patient differs in his or her degree of openness, hunger for information, level of spirituality, and ways of coping; while one prays, another crawls under the covers to cry. Hope, they learned, is not always for a cure, and strength can mean acceptance—not just fighting one’s illness until the very end. The students saw the key role that doctors often play in patients’ lives, and they repeatedly called it a “privilege” to be with people at such a meaningful time. Patients who assist in the course are recruited by the “Living with Life-Threatening Illness” faculty, and matching is done to maximize diversity (of diseases, ages, and willingness to open up) within the small groups, enriching the weekly discussions as students share what they’ve learned from their patients. Last spring, each group had six or seven doctors-to-be and two experienced physicians to guide them. While some student-patient pairs hit it off immediately, others struggled to click. Andrew Billings, who co-leads the HMS Center for Palliative Care with Susan Block, believes those rocky relationships will help these future doctors prepare for careers in medicine, when they will see hundreds of patients, only some of whom will want to connect. “They realize that even if they don’t bond closely, there is much to learn from and offer to such patients,” notes Billings, who also directs the Massachusetts General Hospital Palliative Care Service. For physician-in-training Mark Hanudel, “Living with Life-Threatening Illness” showed how each patient’s life extends beyond the hospital walls, and how important patient-caregiver communication can be. To underscore her family’s desire to have Matthew discharged as soon as possible, Erin Newnan posted a letter from one daughter on his hospital door and medical charts. “Dear Doctors,” it read. “My birthday is April 16th. I’m going to be 10. For my birthday it would be the best present if you could get Matthew home. I am going to ask God, too. Sincerely, Jessica Newnan.” Jessica nearly got her wish: Matthew headed back to New Hampshire in late April. Areej El-Jawahri recalls vividly the moment she realized her medical calling. The year was 1991, and she and her family were still living in Baghdad. Her aunt was about to give birth, so eight-year-old El-Jawahri accompanied her dad and youngest uncle to the hospital. There, the screams of pain, tears, and blood from adults and children injured in the then-unfolding Persian Gulf war left an indelible mark. El-Jawahri and her family left Iraq several years later and in 1997 immigrated to the United States, settling in Michigan. While attending the University of Michigan, her passion for medicine was strengthened by two encounters with death: watching a close friend perish after a hit-and-run car accident, and the loss of that same uncle to lung cancer. Paired with a 60-something woman with metastatic breast cancer, El-Jawahri chatted with her by phone and in the hospital and hospice center, observing the seesawing of her patient’s health and emotions. They became close, shed tears together, and talked about everything from what the woman was reading to how she wanted to be remembered. The pair met regularly in late 1993 and early 1994 and designed their “dream curriculum,” then sought out supportive faculty members, including Billings and Block, now chief of psychosocial oncology and palliative care at Dana-Farber and Brigham and Women’s Hospital. Hallward and Hauser worked with this small group to refine the curriculum, which debuted in the spring of 1995, and then taught for several years in the course. Although originally dubbed “Care near the End of Life,” it was soon renamed to reflect the fact that it was as much about living as about dying. Although it is one of only a dozen or so such classes in the country, “Living” is part of a growing trend that has its roots in the teachings of the late Elisabeth Kübler-Ross (author of On Death and Dying) and many others. Medical schools have made dramatic progress during the past five years in exposing students to end-of-life issues, notes Diane Meier, director of the Hertzberg Palliative Care Institute at the Mount Sinai School of Medicine in New York City. She and fellow authorities say that is largely due to the proliferation of hospital-based palliative-care programs, where students can train, and to factors including reports by the National Institute of Medicine and others calling for change, funding from such organizations as the Robert Wood Johnson Foundation, debates over assisted suicide, new medical-training requirements, and—not least—demand by patients and families. Despite this shift, Harvard investigators and others have found significant gaps in medical-school curricula and powerful forces countering the trend. The “physician culture” has long focused on diagnosing ailments and extending life, while considering death a personal and professional failure. That “hidden curriculum” of values and attitudes is widely conveyed to doctors-in-training, Billings and Block say, especially during their hurried third and fourth years on the wards. Once in practice themselves, these physicians may avoid discussing death for fear of dashing a patient’s hope. In a 2004 survey of medical-school deans around the United States, Amy Sullivan, Ed.D. ’97, of Dana-Farber, and her colleagues found that most of the 51 administrators responding described end-of-life-care education as “very important.” But few schools offered extensive training, and two-thirds of the respondents felt not enough time was devoted to this area. Within the field itself, viewpoints differ about whether the material is best woven into the curriculum or concentrated in a separate course, and whether the first year is the best time to impart these skills. Many concur, however, that these concepts should be reinforced throughout the four years of medical school and beyond. Faculty members also find the experience rewarding. An impressive number—drawn from various disciplines and Boston-area institutions—contribute their time each year, allowing for close student-faculty contact. Some professors have taught in the course for many years, and pediatric oncologist Jennifer Mack, M.D. ’98, also took it as a student. A similar desire to impart her knowledge drove 55-year-old Margo Figueredo to volunteer while undergoing care for end-stage pancreatic cancer. She and her family welcomed student Micah Berry into their home in Mansfield, Massachusetts, and introduced him to numerous relatives and neighbors. Figueredo described her cancer journey and even told Berry one day that she sensed the end was near; two weeks later, she died. At her funeral, family members shook Berry’s hand and thanked him for being part of Margo’s final weeks. It’s a raw April morning, and Teresa Kim and Sopheavy (“so-pea-vee”) Seng grab a booth at the Red Rose, a Cambodian-Thai-Chinese restaurant in Lowell, a mostly working-class city north of Boston. It’s one of many meetings these two young women will have during the semester. Seng is a 19-year-old Cambodian immigrant who was treated for nasopharyngeal cancer (in her nose, throat, and brain) while in high school, then later found herself coughing up blood from a terrifying gastrointestinal illness related to schistosomiasis. “She’s only 19, but she’s lived 20 lives of experiences,” says first-year medical student Kim, who is close in age but has never faced a medical crisis, let alone two. The conversation seems comfortable, as if between two friends. At the same time, as Kim poses questions between bites, this thoughtful Korean-American student from Connecticut is practicing some of the interview tips gleaned in the course. Use a patient’s own words. Be comfortable with silence. Take cues from your patients. More exposure to various perspectives came from the students themselves. The 19 members of last spring’s class included the privileged children of doctors and the son of a recovering heroin addict. Students represented a spectrum of religions and cultures, and when not in class, some organized hunger walks or book drives or danced in the first-year talent show. Like El-Jawahri, many had already encountered death or serious illness through the experiences of a relative or friend, or while on the job before medical school. For the final session of “Living with Life-Threatening Illness,” each student is invited to bring in something meaningful—a poem, song, or thought—as well as a flower representing his or her patient relationship. Sitting around a conference-room table at Dana-Farber, the students and faculty members prepare to take turns reflecting on what they’ve learned during the semester. The patients are absent, but they are a strong presence. Zerden places his flower in a large glass vase at the table’s center, which gradually fills with tulips, sunflowers, and roses to form a vibrant bouquet. One student recites an Auden poem, while another shares one in her native Chinese. A third student passes around pictures of “Warhammer 40,000” miniature soldiers in honor of her teenage patient, with whom she eventually bonded through his hobby. “I’m fortunate and privileged he’s let me into his world,” she says. The faculty members also take turns expressing their emotions, one by playing the banjo. The students thank their patients for their time, wish them peace, and promise to remember them. It’s clear they have absorbed valuable life lessons about resilience, hope, and the fragility of life. Although some continue seeing their patients for weeks, months, and even years, most heed the course guidelines and end their visits by May—despite the awkwardness of the break. Faculty say the process of saying goodbye and thank you is a critical one that allows the students to say, “You’ve been an important teacher and I’ll carry you with me in my practice.” They also hope it will spur patients to have similar conversations with their own family and friends. Debra Bradley Ruder, an editor at Dana-Farber Cancer Institute and a freelance journalist, has written extensively about higher education and healthcare issues. She is working on a book about conversations at the end of life.